11 x 17 Customized Rolled Scroll | Customized Scrolls | Scrolls Unlimited, Inc. This is the perfect recipe for making that lasting impression. 1) Start with the largest scroll we can print on. 2) Personalize with your submitted text and/or artwork. 3) Pick out the features you want to complete that one-of-a-kind scroll. A proof will be sent for approval before scroll is made up. Combine all these ingredients and get your one-of-a-kind masterpiece - complete and ready to impress! Choose to secure it with a tassel or ribbon. Tassel can be used for securing and hanging. 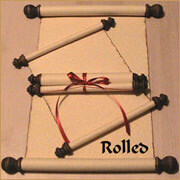 * A CUSTOMIZED SCROLL COMES WITH TWO PROOFS. ADDITIONAL PROOFS WILL COST $5.00 EACH.